We are engaged in Manufacturing and Supplying Ceramic Fiber in the countrywide market. Ceramic Fiber is an alumino silicate based refractory fiber that is widely appreciated by the clients for its various properties. Ceramic Fiber provided by us is as high as 2300Â°F. Ceramic Fiber Textile is strong and abrasive and one can use it in extreme environments. Also, Ceramic Fiber is a commonly used acid and alkali. 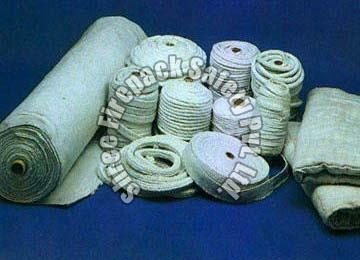 Further, in various insulation and sealing applications Ceramic Fiber acts as a good substitute for asbestos products. Sizes : 1/4", 3/8âï¿½ï¿½, 1/2", 5/8âï¿½ï¿½, 3/4", 7/8âï¿½ï¿½, 1âï¿½ï¿½, 1-1/4âï¿½ï¿½, 1-1/2âï¿½ï¿½, 2"